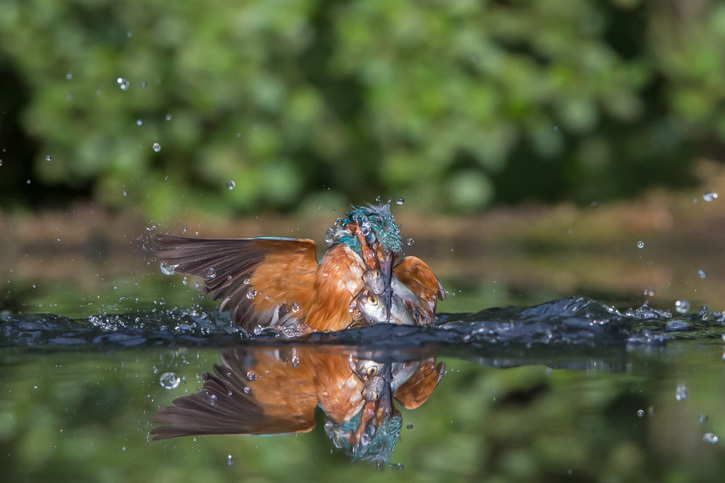 Last weekend was a chance to go to Portugal for a little bird photography. I have enjoyed spring trips to Spain over last couple of years, but thought that I would try Portugal this year. There are some lovely birds which I could not find further north. Having arrived very late in Lisbon thanks to Easyjet’s extraordinary inefficiency, we set out in miserable weather to the area of Castro Verde. This is a lovely part of the country with a large national park, and great birds. The target was Montagues harrier. I had not been able to get a good shot of the male last year, so was hopeful for this time. I did get some pictures of the birds hunting, though it proved very difficult to get close. Watching them glide over the pastures is a great sight though. I also had a session with a nice roller in this area. Quite a character! The weather finally improved and the light with it. There were huge numbers of white storks around and it was fantastic to see this pair displaying. 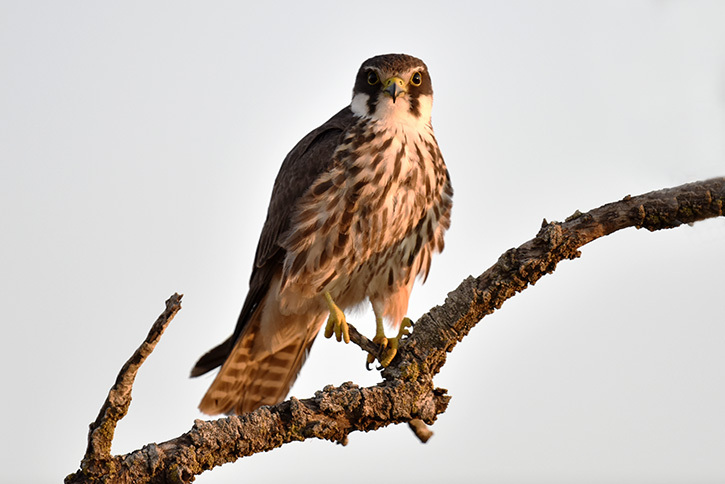 We saw many other birds before moving onto the area around Evora where the target was the lesser kestrel. This is a super little hawk present in quite big numbers in southern Portugal. There were plenty around but seeing this pair mating on the roof of a disused railway station was a real highlight. The colours of the tiles made a perfect setting for the birds. From here we moved onto the Tagus estuary to try and find some black winged kites. There were a pair nesting, but they were extremely shy and I really couldn’t get close enough for a half decent photograph. I will have to go back to try again! It was a lovely weekend, with some great food, especially the black pork and fish. Bernardo was a great guide, thanks. I will be back! Decided to try for quite a challenging subject that I have wanted to photograph for sometime. Wolves in Europe. They are very cautious as they are still hunted, but the attraction of seeing a pack on snow was too much, so I headed for North East Finland. I spent 5 nights in a very small, though not uncomfortable hide with Danny Green, who by pure coincidence was after the same subject in the same place!! The setting was stunning and clearly ideal for the wolves, dense forest and looking onto a frozen lake, with Russia on the opposite bank. Sadly, no joy. We saw a wolverine at 6.00am one morning for about one minute. There was also quite a lot of raven activity which stopped us from going completely mad! At the end of the stint, we left the hide and sadly saw wolf tracks in the forest behind us!!! 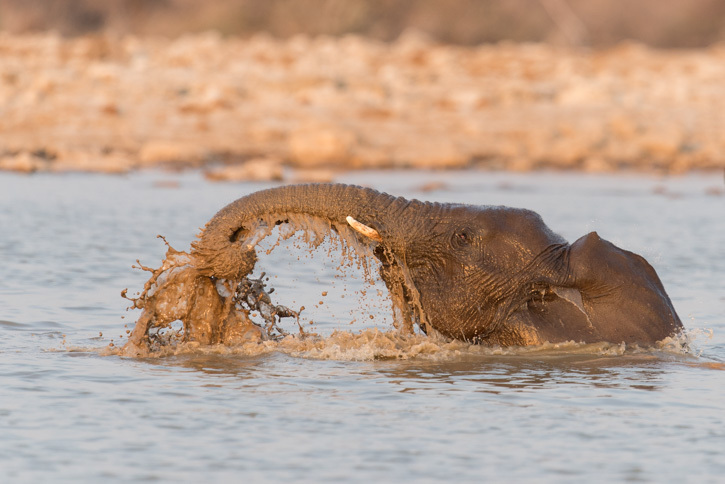 Frustrating, but part of the joy and challenge of wildlife photography is not always getting what you want. Maybe I will try again later in the year, though I think the next time will require slightly better food planning than tinned tuna and pineapple! Just back from a really enjoyable trip to Canada. The purpose was to photograph snowy owls with Marc Latremouille, but due to the weather, I actually got to do some other really nice wildlife as well. I arrived in Ottawa after two weeks of unbroken sunshine to a dull dreary and very cloudy scene, and found to my horror that I was unable to get my sat nav to accept the address of our rendez-vous! This resulted in the 40minute journey actually taking 2 hours. Canadian signposting is not great once you leave the highway. Eventually I arrived and met up with Marc, and old friend Judy along with two other photographers from the States,Cathy and Mike. We were based in an unusual but pleasant b&b and on monday morning started the photography. Our main subject was a beautiful and very co-operative female named Luna. She proved to be a real star and provided numerous photo opportunities. The sunshine in this picture was the one sunny session we had on wednesday afternoon. Most of the time, it was pretty dull, meaning the ISO had to go up much higher than I would have liked. It did however give a more authentic feel. Tuesday dawned with above zero temperatures and rain!!! We decided to change plan and visit a nearby wildlife destination to try our luck with some alternatives. There were some carnivores as well, such as this coyote, sitting like a rather imperious german shepherd! and best of all, timber wolves. Just goes to show that if you go down to the woods, beware!!!! Wednesday was a lovely cold sunny against a blue sky. It was so much easier with good light! We had a great afternoon session, then decided to change plans for thursday as the weather had again deteriorated. Marc suggested a visit to Algonquin state park as he photographed pine martin and fox there, so we all agreed. It was a great call. A long drive but worth it.The park was at higher altitude and much colder, with lots of fresh snow. We went in to one of the camp sites where the pine martins hang out. It seems that the bear proof food bins are not pine martin proof so they can scavenge left overs quite happily there. A very grumpy park ranger didn’t seem too happy with us hanging around the area, but eventually left us.The pine martin didn’t show up again so we went off to find the foxes, for the last part of the day. They were very frisky and great fun to photograph. The following morning we went back to the pine martin and this we were luckier. This is a great little animal, that hardly stops still for more than a moment. Quite a challenge in early light within the woods! There were also some nice blue jays in the area. Finally we returned for a last session with Luna.She performed again as expected, what a great bird! September saw us return to Africa after too long away! We had a great trip starting in a great little reserve in Kwazulu Natal called Zimanga. I chose this as Bence Mate has designed some hides here and having used these hides before, I knew they would work well. I was not mistaken! There are a selection of hides which provided some fantastic images. The lagoon hide was mainly about water birds, and we spent two very pleasant afternoons enjoying the show! 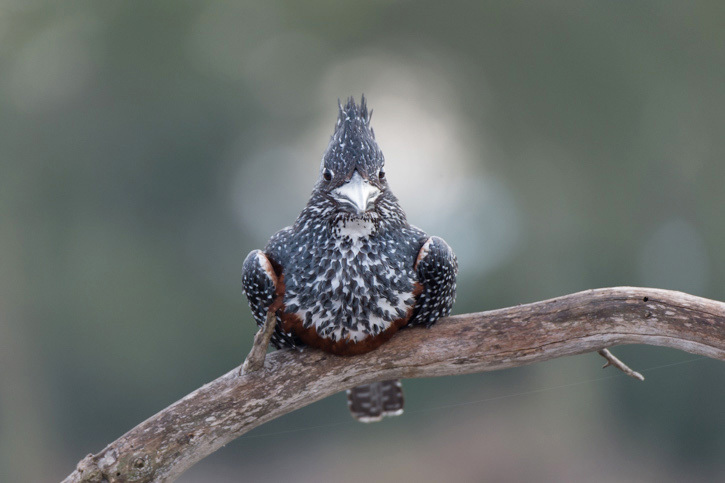 This is a cute giant kingfisher who sat a while looking quite bored! 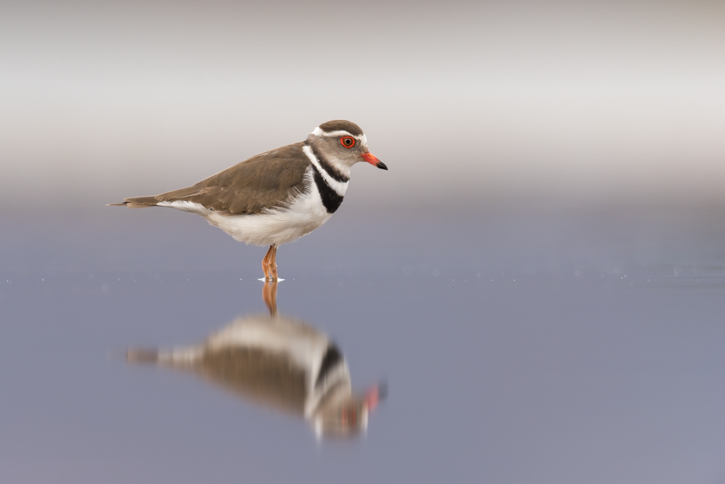 There were lots of chances for reflection shots as well, like this three banded plover. 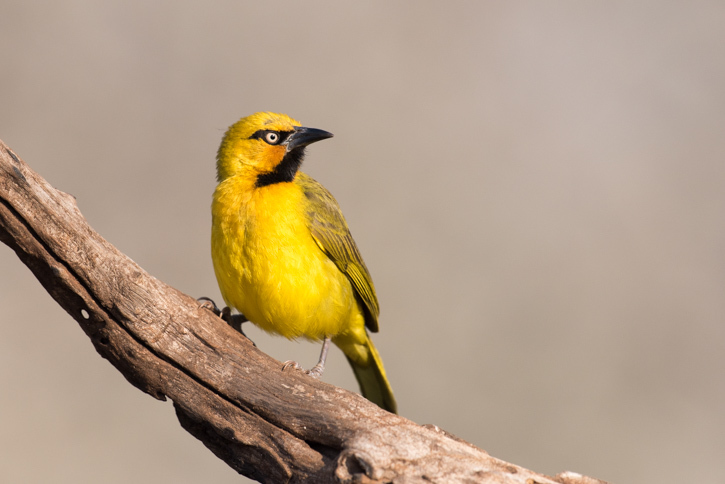 The other hides were in hot drier areas to attract a different range of species such as this masked weaver. 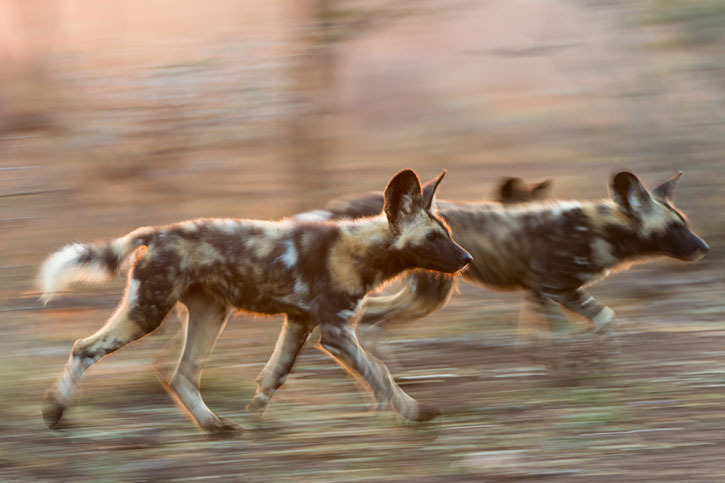 It was not all birds however, as the reserve has a good range of big game, most notably a pack of fantastic wild dogs.These predators are stunning and we had several very close encounters with the pack of six adults and twelve puppies. Watching them hunting through the woods one morning was a real treat. We enjoyed the lodge in Mkuze called the Ghost Mountain Inn for our stay, and our guide Brandon was great. Before long though, it was back to Durban for the flight to Jo’burg then onto Windhoek for a night at the stunning Olive Exclusive hotel. Highly recommended by Nicky! Next morning, we set off for Etosha. A six hour drive along some fairly boring scenery, but with Etosha beckoning, my excitement level kept me going! Finally we arrived at Mokuti lodge, situated by the Namutoni gate entrance to the park. 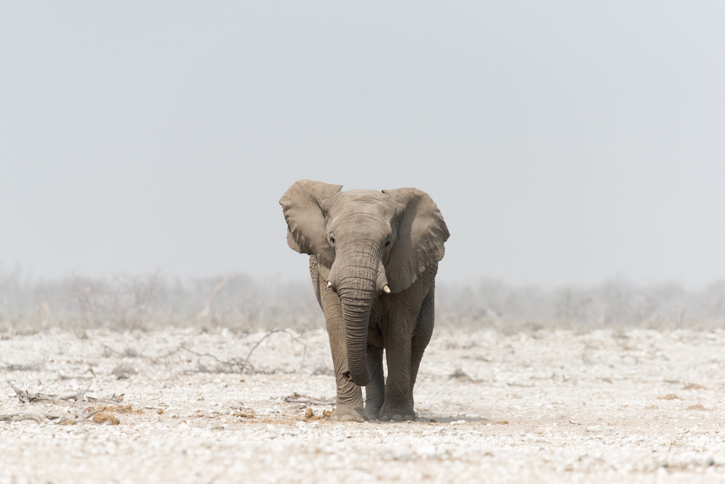 Last time we went to Etosha in the spring, it had been raining for weeks and the park looked very different to the dry parched appearance that greeted us this time. I had always thought of Etosha in that way so I was delighted. 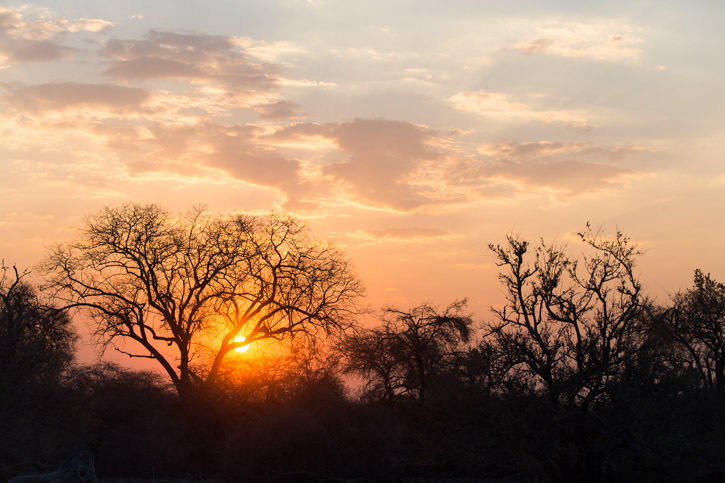 The other great feature of Etosha is that you can drive yourself around and are not at the mercy of a guide, lodge rules and other guests. If you want to stay in one spot all day, you can! For a photographer, that flexibility is so valuable, and certainlyy paid dividends on this trip. 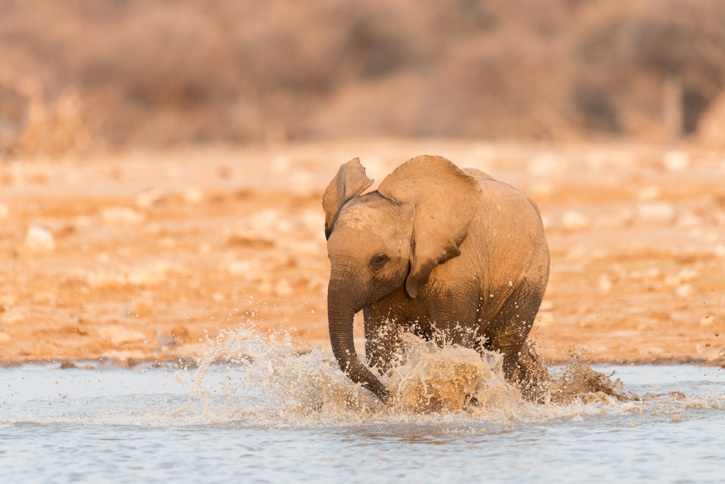 The dry weather meant the the waterholes now provided a fantastic focal point for the wildlife, so the daily routine largely revolved around choosing which waterholes to spend time at.Klein Namutoni and Chudob were the most fruitful at the eastern end of the park, with some wonderful sightings. 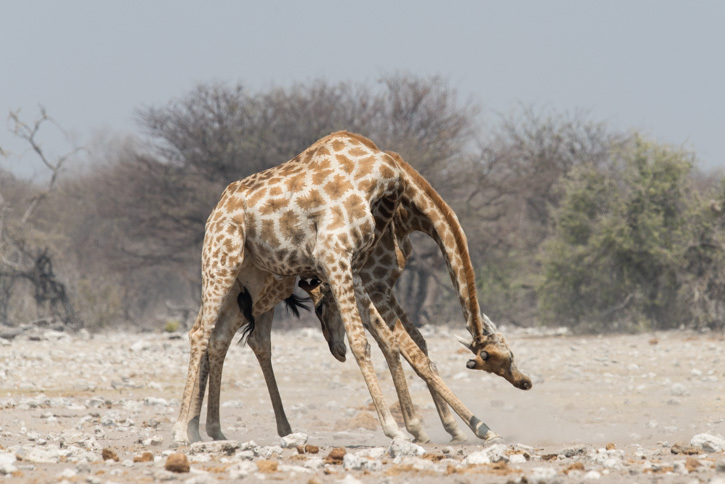 There were huge numbers of giraffe in this area and we enjoyed these two males fighting one day, especially as it takes quite a while unlike some fights, which are over in moments. This shot was taken at midday, and although the light was very harsh, it was worth staying out to enjoy the spectacle. 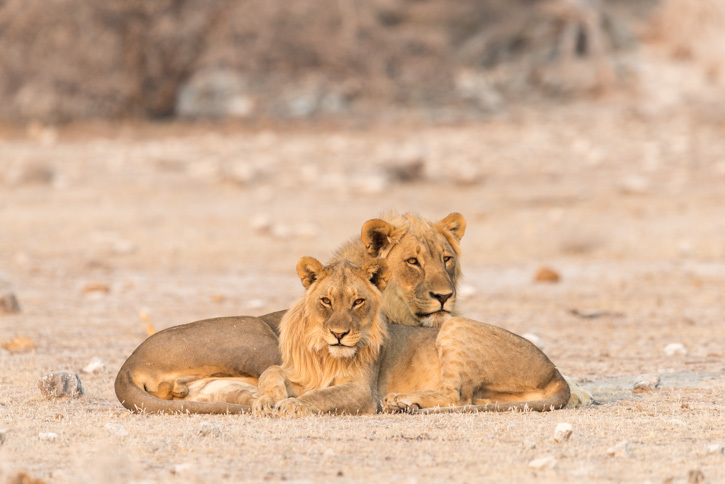 Of course the big attraction is always predators, and we saw the local pride males here on a couple of occasions. 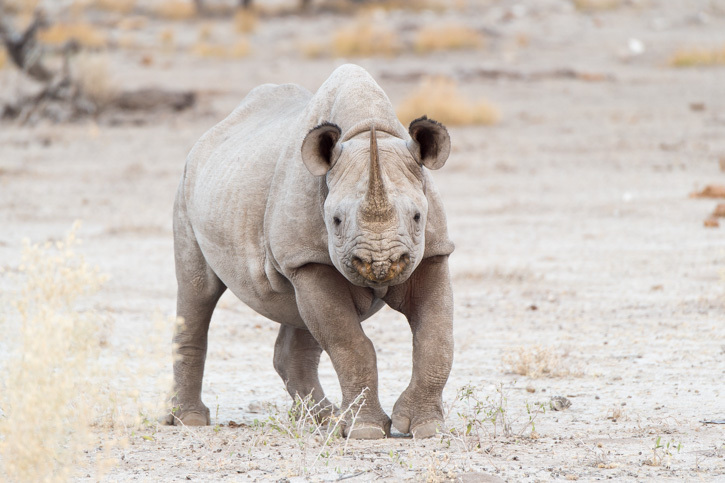 We also had a couple of great black rhino sightings. 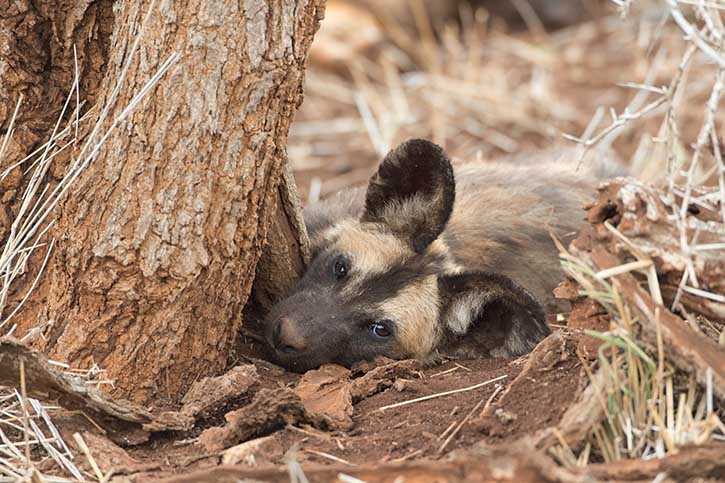 These shy animals are often difficult to find and over the years, I have only seen a couple. Here however, they were much more visible. From Mokuti, we then drove across the park past Halali to Okaukuejo further west. 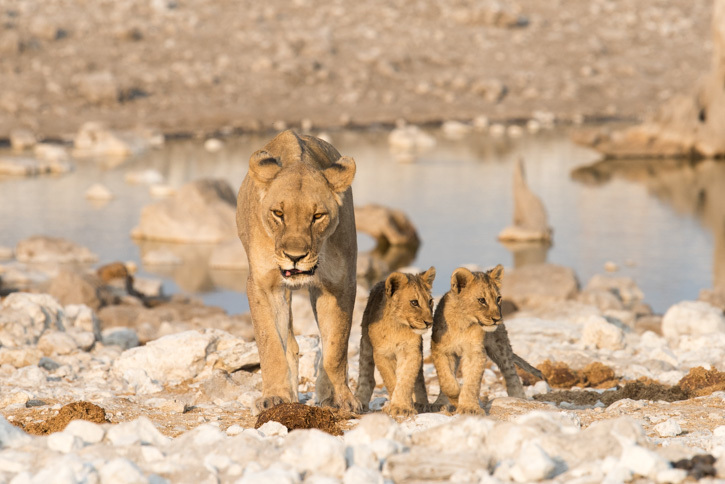 This was a long drive but well worth it as we had some great lion activity in this area, including this female and cubs with the rest of the family at the Olifantsbad waterhole. They were moved on by the elephants that came down to drink. This area also gave us some great elephant sightings. We wanted to see some big bulls out in the dry open areas near the pan, and we weren’t disappointed. 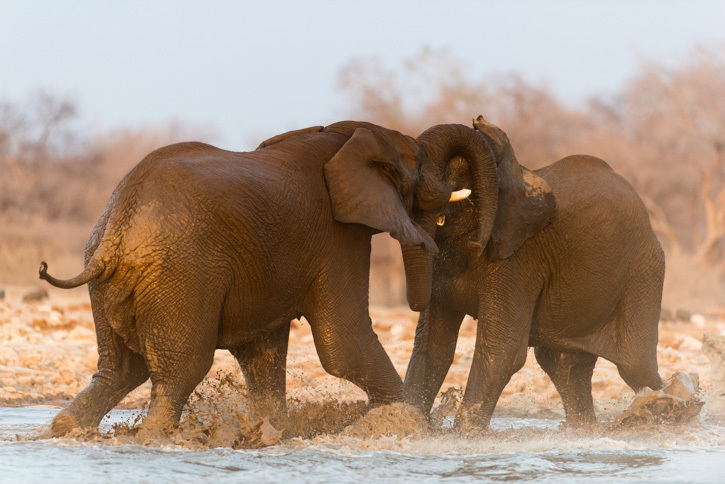 The other reason to visit Okaukuejo was that it has it’s own floodlit waterhole, so it is possible to walk out of a room and stroll down to the waterhole fifty metres away to enjoy whatever is happening. 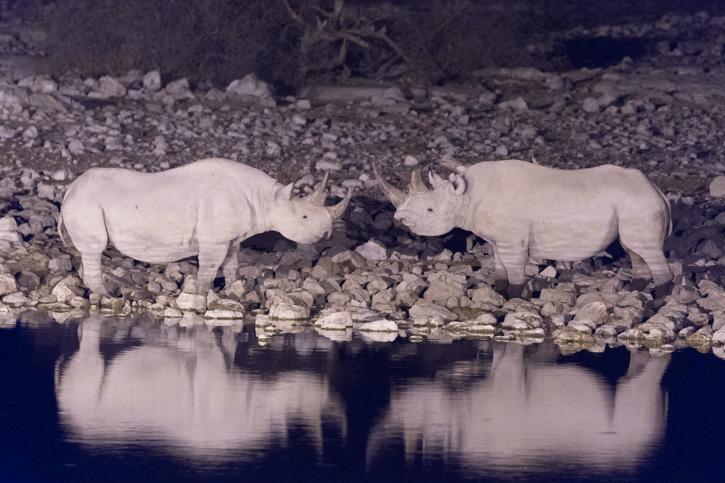 Like these two black rhino saying hello to each other. After two nights, we headed back to Mokuti for a bit more action at the Chudob and Klein Namutoni, and we were again treated to some amazing sights. A family of Elephants came down for a drink one evening. They then decided to get in the water for a bit of fun. This calf clearly couldn’t wait. A couple of bulls also came down to join the others and had as much fun as the others! It was difficult to keep shooting as there was so much going on, and it was a beautiful scene to just enjoy. Finally, it was time up and we had to leave. We drove back to Windhoek then flew to Cape Town. 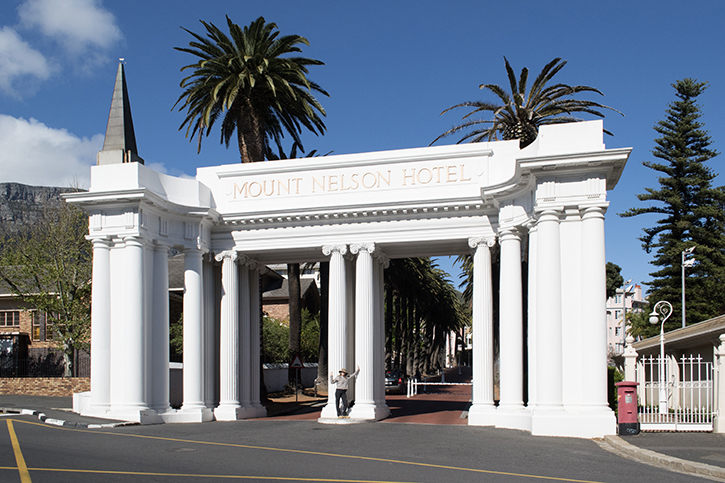 With the Rand being so weak, we decided to treat ourselves to a weekend at the fabulous Mount Nelson hotel. It is so nice to be in a place with a real feel of history. The hotel was the British army HQ during the Boer war and young Winston Churchill sent his articles back to England from here. Nicky was really in her element here. The best bit was that it was next door to one of our favourite restaurants, Nelson’s Eye. Great steaks at great prices, yum yum! 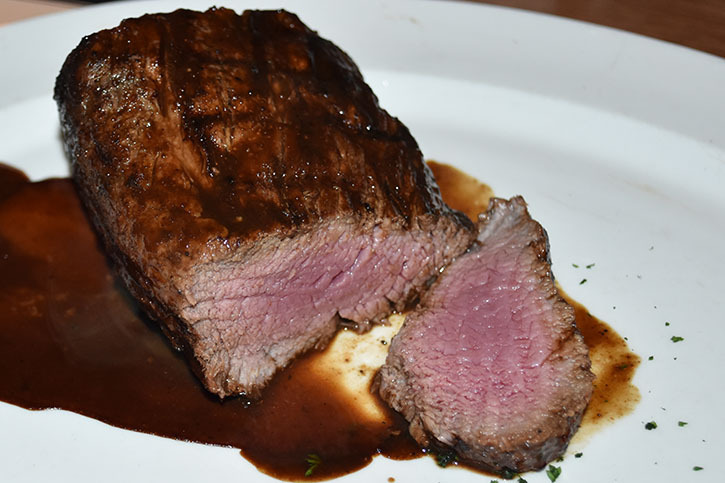 This was a huge fillet cooked perfectly. 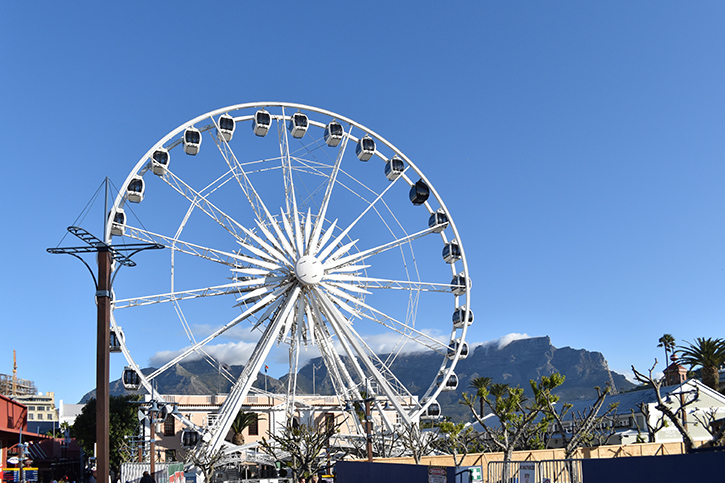 The waterfront is always nice to wander around, and they have now got a big wheel giving a nice view of the area and of course Table Mountain in the background. A lovely day in Kalk Bay and it was time to come home. It was a wonderful trip and I can’t wait to come back to my beloved Africa. 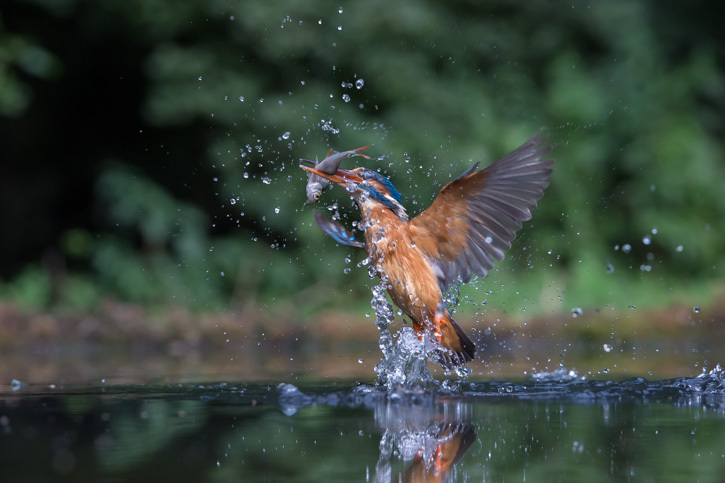 After some time trying, I finally got some decent kingfisher fishing shots! 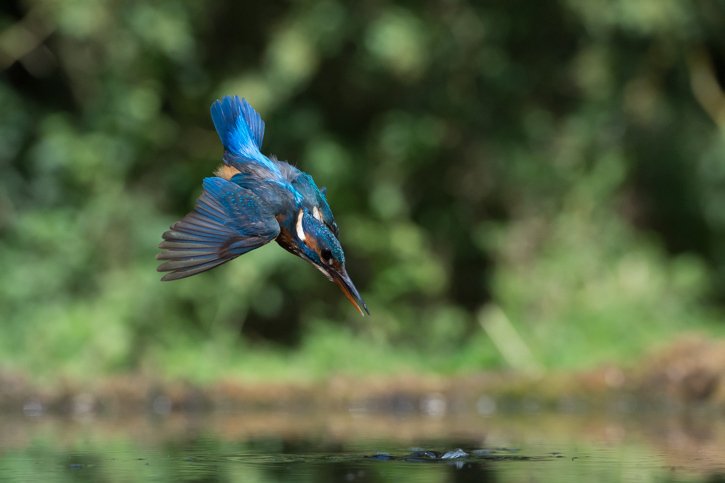 A beautiful day by a Suffolk stream with a very co-operative female feeding her chicks made for a great day. The dive first then the the catch. Two fish at once, almost greedy! Then the take off. Fantastic. 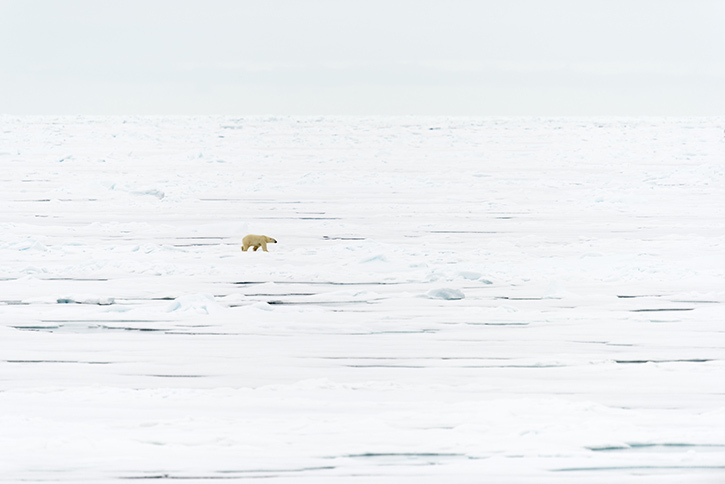 This month saw us return to the stunning archipelago that is Svalbard. We decided to go in July in order to circumnavigate the islands and went back onto the Ortelius to try and achieve this.We had a bit of a scare when our luggage failed to arrive at the airport in Longyearbyen! A couple of nervous hours before the bags arrived on the last flight before the ship sailed! Phew. After the wonderful polar bears at Wapusk earlier in the year,I was hoping for some more scenic views of bears out on the sea ice. Our first bear was found on a grubby beach in pouring rain and wearing a collar! Not a great start, but once we headed north, things got much better. The starkness of this environment is simply incredible and it is amazing that anything survives here. We enjoyed following a few bears during the first few days. 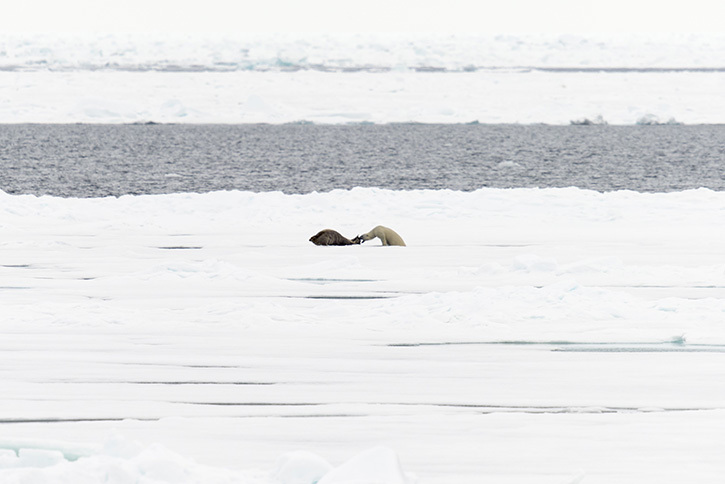 This next shot shows a male trying to catch a bearded seal. It was amazing to watch the bear close in, then dive under the ice coming up suddenly through the seals breathing hole. The seal had another hole close by and just managed to escape the jaws of the poor polar bear! Shame it was long way off! 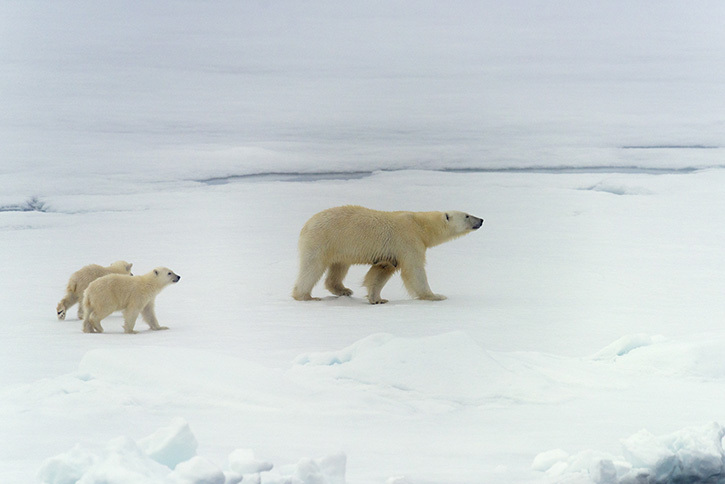 The other polar bear highlight was a wonderful mother with two young cubs. They appeared as we crawled through some thick fog, and were almost impossible to see. With a bit of photoshop magic, the bears are at least clear, though the images are of poor quality. 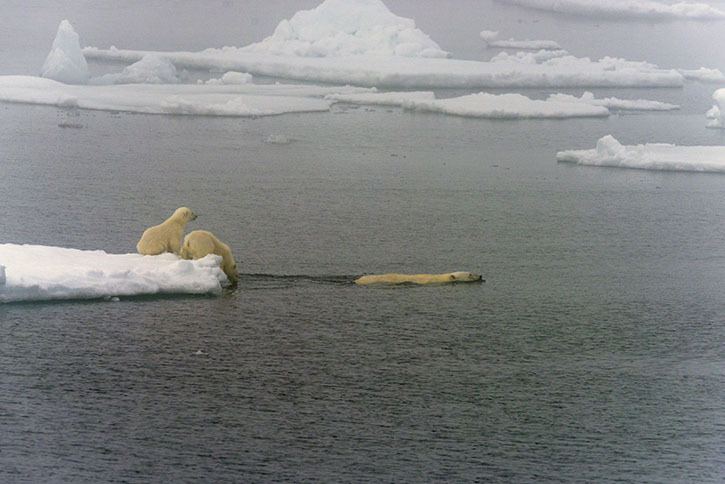 After walking past the ship they swam across to another area of ice and disappeared into the murk. It wasn’t just polar bears. There is plenty of wildlife to keep anyone busy. 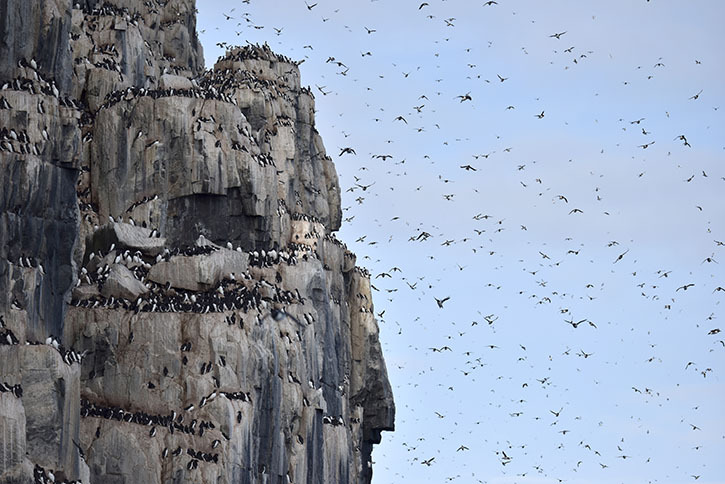 We entered the Hinlopen strait and visitied the wonderful bird cliffs at Alkefjellet where thousands of Brunnichs guillemots nest. A wonderful site as huge numbers of birds fly past in every direction. 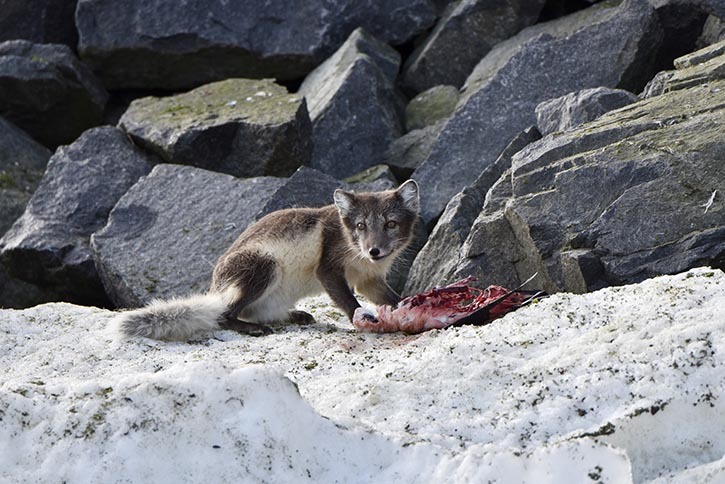 At the base of the cliffs, arctic foxes can sometimes be seen looking for birds that have fallen. We saw a dark morph fox walking high above us, then a glaucous gull tucking into the body of a dead guillemot. We then noticed another much more confident fox trotting down the steep slope. 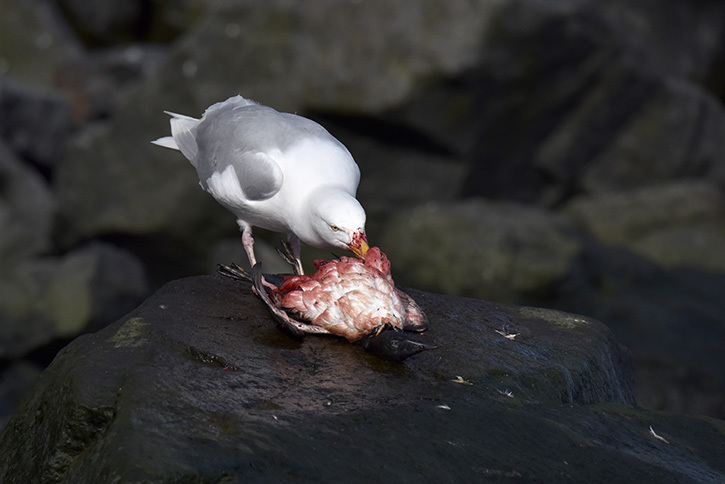 It promptly stole the carcass from the gull and enjoyed the remains of the dead bird. As we reached the east side, we found increasingly difficult 9/10 ice. We had an amazing evening breaking through and were the first ship this year to make it. 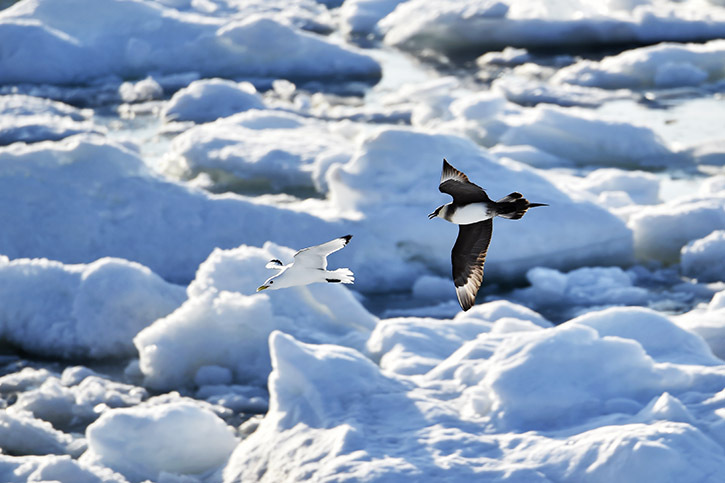 As the ship broke up the ice, black legged kittiwakes swooped in to pick fish out of the sea. They were then engaged in amazing flying displays by arctic skuas trying to get the fish. 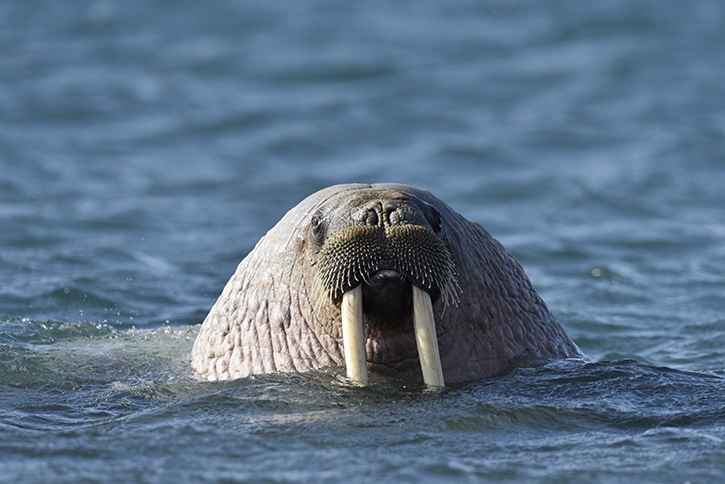 We made it through some very tricky ice and currents and proceeded south to Edgoya where we met this wonderful walrus. 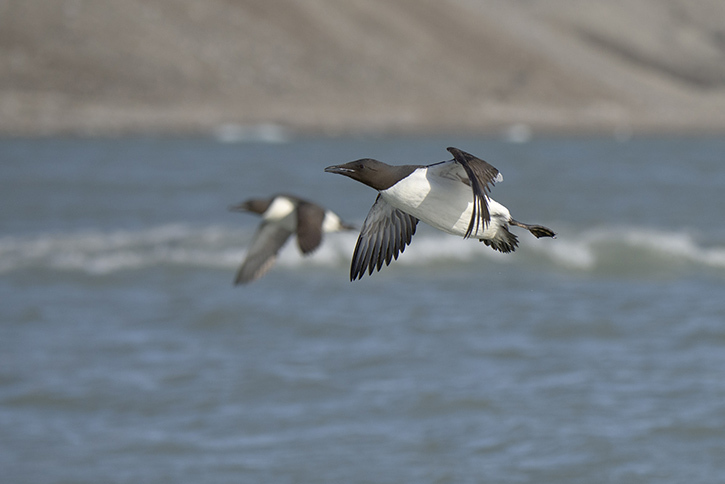 They are very large and cumbersome on land but glide effortlessly through the water. Cute?! 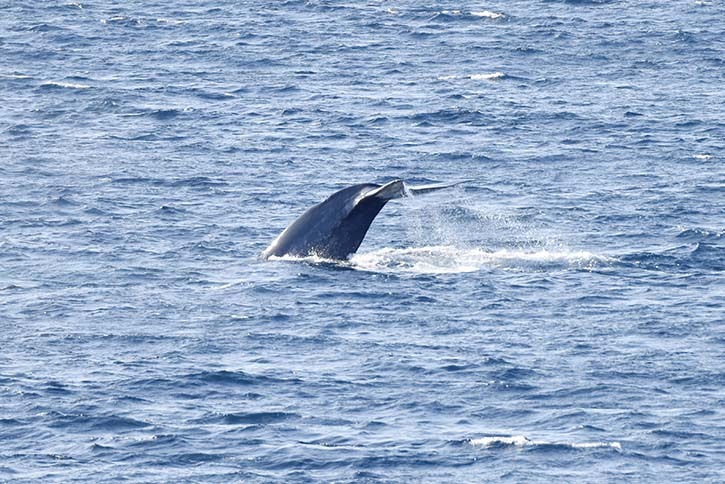 From here we head back towards Longyearbyen, but on our final afternoon, had another great sighting as a blue whale and her calf were spotted . We enjoyed this amazing sighting for about half an hour. It was a great trip with some lovely travelling companions. Can’t wait to go back! 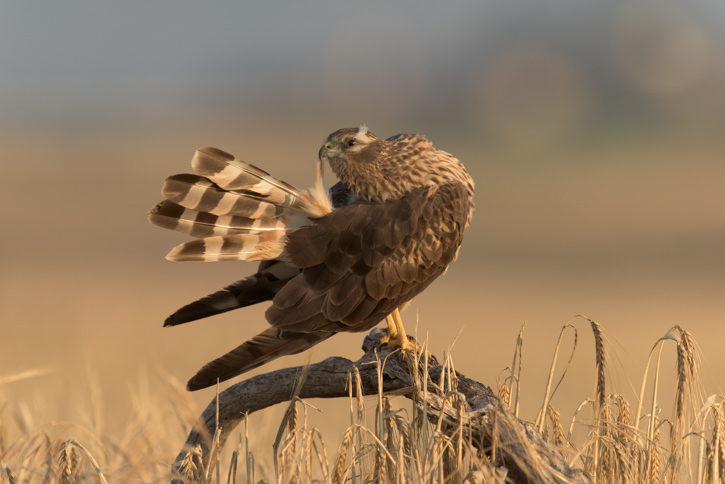 I went to North East Spain last summer to photograph some of the raptors that spend their summer there. I was only partially successful so decided to try again. This year was better as I wanted to try and find Hobby along with Montagues harrier and managed both. First up was the harrier. This is a lovely bird that comes up from Africa to breed. They nest in different sites each year, and the position sometimes lends itself to an appropriate perch for photography. So here is the lovely female in early morning light. The only problem was that the male, who undoubtedly is the more attractive bird, stayed high up in the air! Have to go back next year for that one! That evening,I had the chance to go to a Little owl nest. There were 4 chicks, two of which had gone, but two were still around. 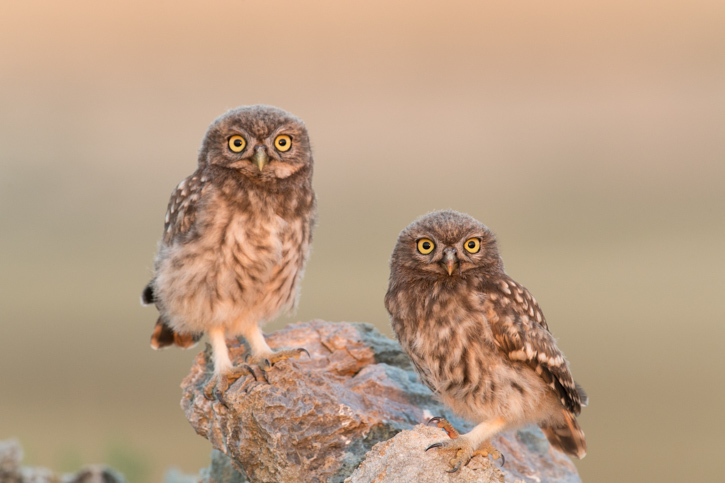 It was a beautiful evening and the little owlets were very cute! I spent a great couple of hours with them. The following morning was Hobby day! There were a pair around, but they were using a number of trees so judging where to position the hide was a bit hit and miss. 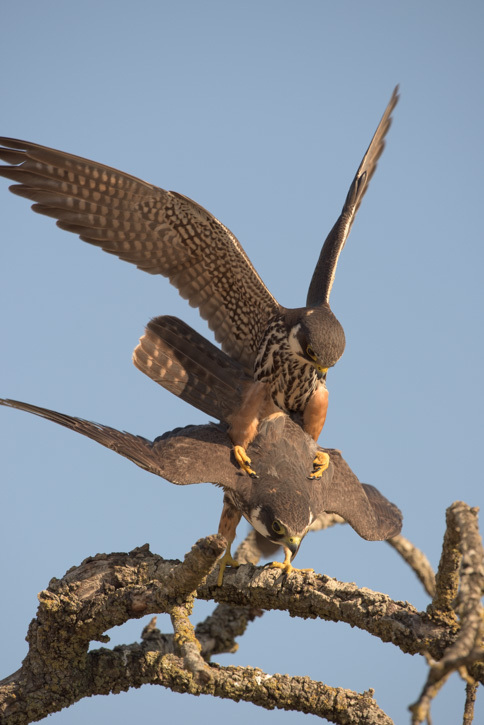 Luckily we chose the right position to enjoy these fantastic little falcons. Not only did they land in a reasonable position, but they were also mating, though, this is quite late in the season and may be a problem for them. As ever, although a bit rushed, it was a great weekend. Thanks to my friend Roger for his help.